Swan Inn Los Cristianos - tasteful live music and really cheap drinks! 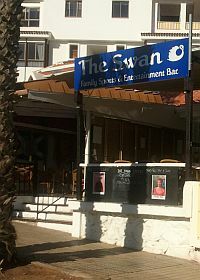 The Swan Inn Los Cristianos is a small bar situated at Parque Margarita, just opposite Cristian Sur. Since the middle of the 2000s, it has gone through several changes of ownership (and even name! ), but always maintains the same level of service - excellent! For a couple of years, the bar was owned by veteran Tenerife entertainer, Linda Day (more of her below). She subsequently felt that owning and running a bar/restaurant was more work than she wanted and sold it to a family hailing originally from Barnsley. The kitchen was fully refurbished and the family's expertise in the culinary arts meant that the restaurant began turning out superb British-style dishes. After only a brief time, this family sold it to a couple - Tony and Chris - who really added to the bar's atmosphere. The family from Barnsley were eventually drafted back in to work the kitchen. The bar was refurbished and renamed "Sensation" (but everyone kept referring to it as "The Swan"). The latest news I can find in forums is that it has changed hands once again and has reverted back to its original name. It's all very complicated, isn't it? Throughout all these upheavals, Linda Day has stayed loyal to the bar, once performing there every night. She has been working the island for some 20 years and it is a testimony to her talent and professionalism that she is still going strong. Even though, as a fellow keyboard/vocalist, I should be Linda's rival, I have a lot of time for her. I knew her reasonably well when I lived in Tenerife and she even managed to put a bit of work my way, when she needed someone to stand in for her on nights she couldn't do. As the years passed, however, Linda has gradually cut down the nights she performs at The Swan, resulting in her appearing, currently, three nights only. Another entertainer I've discovered who performs there is accomplished singer, Gary Paige. The live entertainment begins at around 9pm and, on Linda's nights, she is open to requests and even welcomes anyone from the audience up on stage if they wish to sing! Customers have reported on forums that the bar is graced with friendly, efficient staff and you are guaranteed a great night out. It appears the Swan Inn has it all - give it a try! To find it, start from the mini roundabout at the bottom of Los Cristianos (near where the Sunday market takes place) and walk up the hill away from the sea. When you come to the large roundabout, turn left and eventually you'll come to a small collection of bars and restaurants. The Swan Inn is there.